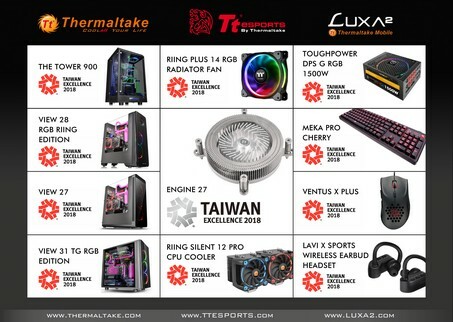 Taipei, Taiwan － March 8th, 2018－ Thermaltake, Thermaltake Gaming Tt eSPORTS and Thermaltake Mobile LUXA2 are excited to set a new record by winning the “26th Annual Taiwan Excellence Award of 2018” for 11 amazing products. This award marks Thermaltake’s 7th consecutive victory in a row. And this year Thermaltake encountered fierce competition; competing against a total of 1,209 entries worldwide and facing a 90 member jury panel and 10 examiners. These eleven awarded models all reached the high specifications of the Taiwan Excellence award, including the degree of R&D, design, quality, and marketing. 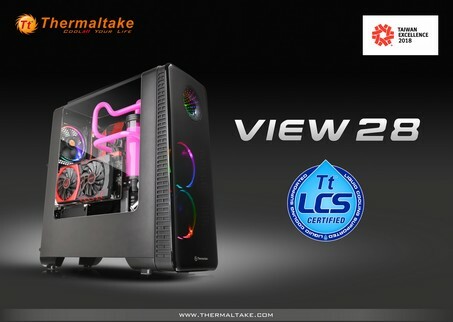 The judges were impressed by the innovation, cutting-edge technology and unique design found in the Thermaltake chassis, including: The Tower 900 E-ATX Vertical Super Tower Chassis, View 27 Gull-Wing Window ATX Mid-Tower Chassis, View 28 RGB Gull-Wing Window ATX Mid-Tower Chassis and View 31 TG Mid-Tower Tempered Glass Chassis. 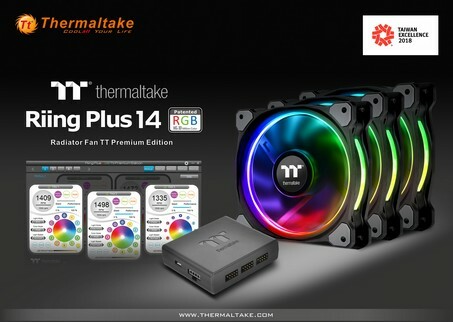 The Thermaltake air cooling products and power supplies were also applauded for their advanced RGB technology : Riing Silent 12 Pro CPU Cooler and Riing Plus 14 RGB Radiator Fan TT Premium Edition; and Toughpower DPS G RGB Titanium 1500W Smart Power Supply Unit. 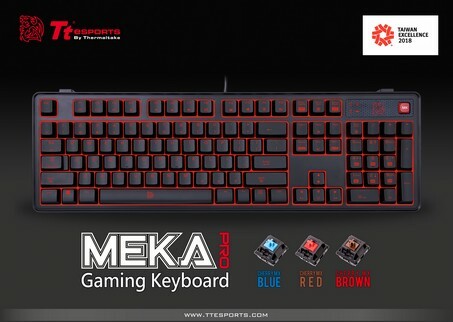 Tt eSPORTS won the award with the MEKA Pro Cherry MX Mechanical Gaming Keyboard and VENTUS X PLUS Patented Design Smart Mouse. Thermaltake mobile LUXA2 achieved the honor too, with the Lavi X Sports Wireless Earbud Headset. 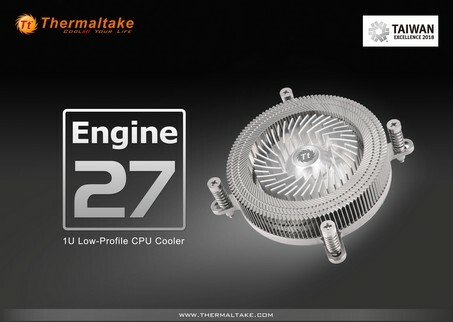 The Thermaltake Engine 27 1U Low-Profile CPU Cooler in particular, even earned the “26th Annual Taiwan Excellence Silver Award”! A masterpiece by Thermaltake and Watermod France. 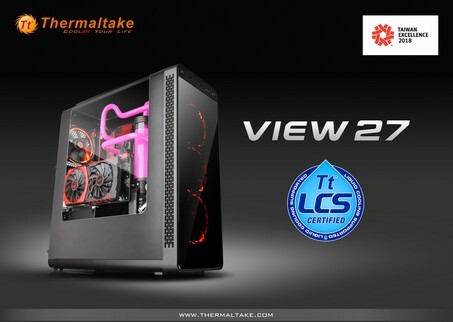 This collaboration signifies a breakthrough in the casemod market, and Thermaltake delivers with excellent craftsmanship, materials, and design innovation. The Tower 900 series features a vertical mounting design, high quality 5mm thick tempered glass panels, and unrivaled expansion capabilities for massive custom liquid cooling systems. 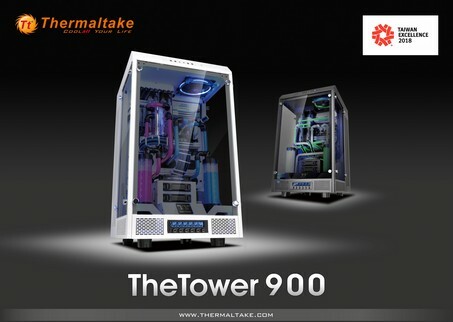 Designed in collaboration with Watermod France, The Tower 900 series represents Thermaltake’s passion for innovation, the spirit of Watermod France, and our vision to provide enthusiasts more chassis designs to build in a new era of modding culture. Specially crafted with a curved window, users can fully display their system whilst keeping the interior dust free. Additionally, the View 27 offers a superior hardware support with complete thermal solution. The tool-free drive bay design allows users to freely interchange the hard-drive cages to suit their particular needs. Moreover, with the dual VGA placement layout, users can choose to place the graphic card either vertically or horizontally. Most importantly, the View 27 is perfectly designed for liquid-cooling system. It is compatible with DIY liquid cooling radiator and AIO liquid cooler. The new Thermaltake View 27 Gull-Wing Window ATX Mid-Tower Chassis is the best choice for both entry-level users and experienced PC enthusiasts! The chassis features tinted front panel with a controllable 256-color RGB LEDs matrix, give users gorgeous galaxy look whilst adding incredibly stunning visual perspective to the system. The View 28 RGB Gull-Wing Window ATX Mid-Tower Chassis Series has large internal space for air/liquid cooling solutions allows users to mount up to three 120mm fans and a 360mm radiator in the front; a 120mm fan, radiator in the rear and a built-in Riing RGB fan. Moreover, it comes with an integrated power supply shroud for clean cable management, and also supports advanced floating GPU mounting system as well as all high-end PC hardware. The View 31 TG is pre-installed with two patented Riing 14 Blue LED fans, features right and left tempered glass side panels to demonstrate the maximum visibility to show off internal components, and allows the Riing 14 LED fans to illuminate and add more excitement to your build. The chassis comes with 3.5” tool-free drive bays with a modular drive rack to deliver ultimate storage capacity or liquid cooling expansion. The magnetic fan filter on the top and bottom fan filter perfectly protect the chassis against dust. It guarantees unparalleled expandability for high-end configurations and liquid cooling system to satisfy the market where users have opted for stylish PC chassis with advanced features and aesthetic appeal. 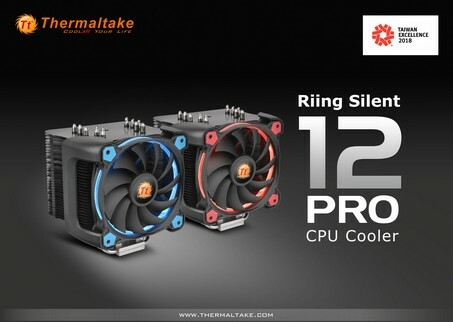 The Riing Silent 12 CPU cooler is designed for use with high-end RAM and motherboards. It is with PWM function which allows the motherboard to run the fan precisely at its necessary speed. This guarantees the required cooling and minimizes the noise level. A 120mm fan fitted to enhance the airflow produces impressive cooling performance with an optimized 11 fan-blade design. Hydraulic bearings for silent operation guarantee ultra-low noise. The patented LED ring maintains color and brightness uniformity, and the lighting effect is visible from all sides and angles. The world’s first high-static pressure fan that is engineered with a patented 16.8 million colors LED ring and 12 addressable LEDs. Features like compression blades and hydraulic bearing deliver impressive cooling performance and ultra-silent operation. Users can also monitor the fan performance, change the fan speeds, and customize the lighting with Thermaltake’s patented Riing Plus RGB Software and the exclusive Riing Plus RGB App. Functions within the software and app allow users to personalize colors for each LED, and also provide users with numerous lighting schemes, such as Sound Control, Ripple, and RGB Spectrum. The lights can even correspond to CPU temperature by applying Thermal Mode. Other basic functions are also designed in the software, including Color Palette, LED Brightness, Fan Speeds, PWM Mode, CPU temperature monitoring. The Toughpower DPS G RGB Titanium 1500W Smart Power Supply Unit is pre-installed with an ultra-silent 140mm patented RGB fan and manufactured by premium components, it is the most ideal choice for those looking for the perfect balance between PC aesthetics and 4K gaming performance. To provide unbeatable performance for Virtual Reality, the PSU is equipped with 100% Japanese capacitors which are rated up to 105°C. 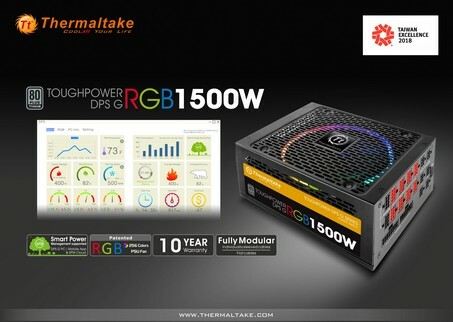 The fully modular Toughpower DPS G RGB Titanium 1500W Smart Power Supply Unit is specially designed with a digital control board and adopted a 32Bit Microcontroller Unit (MCU) from STMicroelectronics. In addition, it offers a 10 year warranty, ensuring the best power supply quality and top VR experience! The Engine 27 offers an excellent balance between performance, size and acoustics with the low-profile design, along with the most advanced thermal techniques. Unlike traditional CPU coolers, the Engine 27 is designed with 27mm height and a compact size 60mm fan that is the ideal choice for any slim systems. Moreover, with metallic (aluminum alloy) fan structure and the built-in PWM fan, the Engine 27 guarantees extremely low noise level without compromising on the cooling performance! The MEKA Pro Cherry MX Mechanical Gaming Keyboard comes in a simplistic durable design packed full of features and functions for the most avid gaming enthusiasts. This includes the use of the latest and highly responsive Cherry MX Switches with a 50 million click lifespan, individual per key red backlight illumination with 7 stunning lighting effects to choose from, 4 pre-configured - RTS/FPS/MOBA/MMORPG - game mode lighting zones, 100% anti-ghosting support, and on-the-fly macro recording for ultimate customization of your gameplay settings. It is equipped with an integrated Bluetooth communications device that syncs with both mobile devices (iOS/Android) and PC systems to record all mouse usage statistics for different activity types, such as: FPS, RPG, RTS game genres; performance analysis for total distance, total action, actions per minute; and action statistics for lift off, distance and clicks per minute via the Tt eSPORTS PLUS+ App. Users can then share these performance statistics to the Tt eSPORTS Community & Data Management Platform (http://plus.ttesports.com/) to compare usage with pro players and friends or create challenge requests with other users in competition mode. 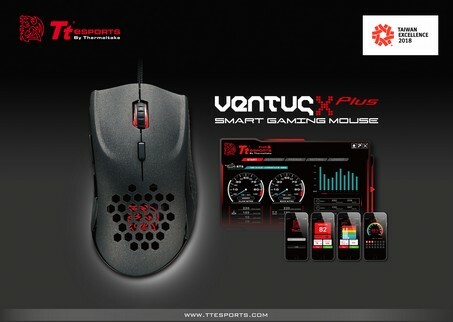 The VENTUS X PLUS Patented Design Smart Mouse is packed with the latest tech and is equipped with a powerful laser engine with up to 10,000 DPI, ARM 32BIT controller for optimal responsiveness, Japanese branded OMRON 20-million click rated switches, on-the-fly DPI adjustment for maximum flexibility, adjustable weight system, and up to 6 programmable key options for maximum customization for your gaming experience! 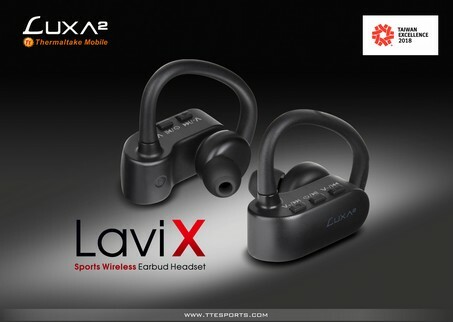 Equipped with True Wireless Stereo and individual 14.2mm driver with HD quality sound, the Lavi X Wireless Earbud Headset offers a supreme audio experience with maximum audio wireless freedom from messy cables; and provides a tangle and hassle-free experience for sporting and workout enthusiasts to fully concentrate on their sessions without distractions. With a dynamic dual pairing mode, users can opt for both single and dual mode use – perhaps even share with a workout partner – to get the most out of their set activity. The Lavi X Wireless Earbud Headset comes in an ergonomic construction with anti-slip earhook design and three interchangeable (S/M/L) earbuds that provide safe, secure and comfortable fit for even the most intense workouts and sporting activities. The IPX4 rating of the Lavi X Wireless Earbud Headset also offers additional sweat protection and included hard carrying case provides maximum protection and added portability during travels. The handy physical controls provide easy access to media buttons and switching between music to calls, whilst providing 6 hours of quality playtime and requiring only an hour to fully charge via fast charge. Taiwan Excellence Award" winners and are based on five key indicators: R&D, Design, Quality, Marketing, and Made in Taiwan. The five indicators are of equal importance, and each is judged on its "Innovation Value," the most important standard of all. Products that receive the "Taiwan Excellence Award" are authorized by the Ministry of Economic Affairs (MOEA) to use the "Taiwan Excellence" mark. The "Taiwan Excellence Mark" is made up of six interwoven curves, and the overall design is inspired by the spirit of "fulfillment" in traditional Taiwanese culture.